Cherish your CD or DVD collection? Hopelessly out of wall space? Organizational law'n'order skills limited to quarterly yard sales? Simply ditch stuff that prevents you from remembering - what color your carpet was before clutter banished it from sight? Considered Case Logic or another brands of software storage? Reacted aghast at cheesy quality? Flinched at the grim prospect of scratching your treasured polycarbonate surfaces? Still perfectly clueless where you'd put that important cover art with its track-listing booklets? One Dominick Martinetti to the rescue. Holed up in Hong Kong bored with Chinese food, he reckoned one day "Slappa me silly, old chap, we can duh betta!" Combining American can-do sass and Chinese ingenuity of a crack team of collaborative prinicipals with the resource and cost advantages of their chosen Pacific Rim exile, this collective attitude birthed SLAPPA. It's a freshly minted company specialized in mobile software storage solutions that will shortly launch cellphone and PDR carriers as well. To be honest, the prospect of reviewing their SLAPPA's cases held mighty appeal. No audiophile angst over break-in, setup and "Can I, can I not hear it?" 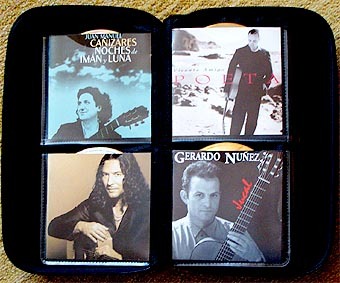 Practical self-interest, too - I routinely take CDs on the road to have familiar demo material on hand. U-turn that is. 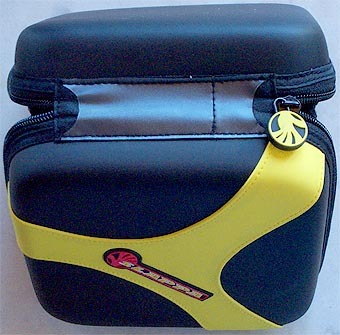 The molded DuroShock cases utilize modern plastics for an agreeable tactile feel that's coupled to stout impact resistance when packed in a suitcase at the mercy of underpaid airline baggage personnel. The lining is synthetic corduroy, all strategic seams cleanly stitched rather than glued or heat-welded. The interior double pockets sport clear frontal artwork displays sewn atop the non-scratch two-sided velvet backing sleeves for the actual discs. Like a book, the individual "pages" are sewn at the spine rather than hole-punched. Flipping through a fully loaded container is a cinch. Nothing binds up. A good-size cleaning cloth is included. A small slip pocket on the spine accepts custom labeling forms. Two are standard, an unlimited supply may be downloaded from the SLAPPA website as pre-scaled Word document. Units with 32 ($13,99), 64 ($19.99) or 128 ($$28.99) double-dip pockets are available in a variety of bold color schemes. For actual capacity with CD artwork? This number must be halved, i.e. the SL-32 holds 16 CDs + 16 covers. 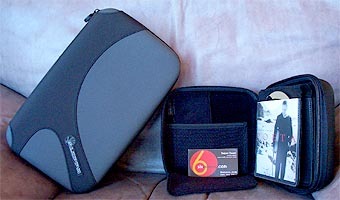 Even the larger-capacity cases don't exceed the 3-inch width of the smallest unit. To increase holding volume, they simply gain in height and depth to display four or eight CDs simultaneously. Remember that 16 CDs in their jewel cases take up precisely 6 lateral inches. Can you appreciate how deeper shelving could drastically reduce the running-foot span of your current wall-based storage arrangement? 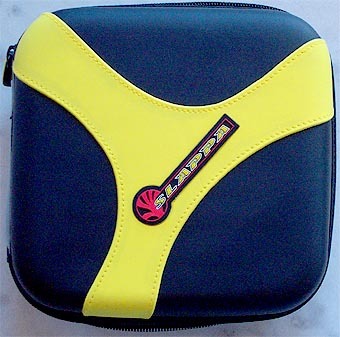 Now, after this inspection, should you consider SLAPPA's goal -- to build the world's best mobile CD storage cases -- successfully met? I'd say. However. I have one li'l suggestion. It's got nuttin' whatever to do with structural design, build quality, appearance or usability. It simply adds a feature such as a methodical German might appreciate. To wit, the current label location on the spine. It rightfully prevents full usage of available height. Why? You'd otherwise wrinkle the label like a Shar-Pei each time you open the case. It also prevents full usage of length (considerable with the larger units) since you'd never successfully insert a long narrow strip of paper into a long narrow sleeve without running afoul of suitable curses. Truly, for a comprehensive listing of the contents, the underside of the cases provides the perfectly stable and far larger surface. I'd affix a single clear captive sleeve to the back of each case to contain a complete CD/track sheet. I'd then use the spine label to merely indicate brief categories -- "Jazz: Armstrong - Ellington" -- and reserve the itemized index for the back. True, you could counter that the provision to include the original artwork inside the case renders such outward duplication redundant. Hey, but I do hail from Germany originally. Us Deutschländer are pettifully brainwashed. We sweat over perfection whether anyone needs it or not. So there. Global citizens not cursed with this terminal Teutonic syndrome? They will call the SLAPPA cases picture-perfect as is. Having lived in the US for going on 20 years -- and with zero intentions of returning to the Fatherland -- I concur. The SLAPPA team's solution is well thought out. It's very well put together, attractive, apparently durable enough to survive anything you'd reasonably throw at it (just don't give it to Mr. Hardbody), easy to clean, even easier to use. And did I mention? It's very fairly priced, i.e. within striking distance of the shlock competition. US orders process through the company's Florida office and ship from Jacksonville. Order entries presently register through the company's hip website. Hmm. Seems that the pickled jellyfish and deep-fried monkey tail Martinetti and associates gobble up in their favorite Hong Kong eateries do inspire - not only revulsion with weak stomachs but the requisite creativity, persistence and persnickety research to build a better mouse trap. Without a special tariff no less. Consider me caught then - my CDs, that is. It's the cheese in the trap. It lures us cool cats, ya know? Our slogan's "Got music, will travel". Now - whom shall we visit next?